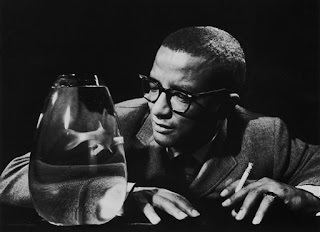 Billy Strayhorn may not be a name recognized in every home but he his music is probably much more recognizable than his name sake. Those that recognize the name probably know him best for his collaborations with jazz legend Duke Ellington. Strayhorn and Ellington's creative partnership lasted for over three decades and many believe that much of the music Duke Ellington takes credit for writing may have actually been penned by Strayhorn. Billy "Sweet Pea" Strayhorn was a quiet, reserved man that was much more comfortable allowing others to be in the spotlight while he played the supportive role. His most popular compositions include "Take The A Train", "Chelsea Bridge", "A Flower Is a Lovesome Thing", and "Lush Life." Billy was born November 29, 1915. In 1938 Ellington was performing in Pittsburgh and Strayhorn went to see him. Following the performance, Billy went back to met him. During this meeting, Strayhorn showed Ellington how he would have arranged one of his songs. The Duke was so impressed that he went and gathered other members of the band so they could also hear Strayhorn's interpretation of some of their songs. The following year (1939), Strayhorn was moving in with Ellington and his family. It was through Ellington's son Mercer that Strayhorn would meet his partner. Mercer introduced Billy to Aaron Bridgers. Strayhorn and Bridgers would remain a couple until Bridgers moved to Paris in 1947. Strayhorn was openly gay and Lena Horne would still call him the love of her life. He was charismatic and charming and had a way of influencing everyone he would meet. In 1964, Billy was diagnosed with a cancer that would take his life in 1967. He passed away in the company of his then partner Bill Grove. Please check out Strayhorn performing Lush Life below . . .